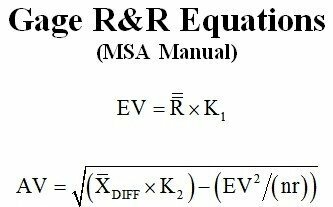 D2 values appear in Gage RR equations when using the Average and Range method. The Average and Range method uses constants to estimate Gage Repeatability and Reproducibility (GR&R). There are two “K” constants “K1” and “K2”. Quality Engineers use them to estimate repeatability and reproducibility. Each of these “K” constants use d2 values in their computation. Note these d2 values depend on the number of trials, parts, and operators. Tables of d2 values appear in various editions of the Measurement System Analysis (MSA) manual. A section of these d2 values appear below. In the d2 values table, the columns represent the number of replicate measurements. We call each group of replicate measurements a subgroup and the MSA manual uses “m” to denote the subgroup size. As an example, suppose one operator measures a part feature, on a single part, three times. These three values are replicate measurements that form a subgroup of size m=3. The rows in the d2 values table represent the number of subgroups “g”. 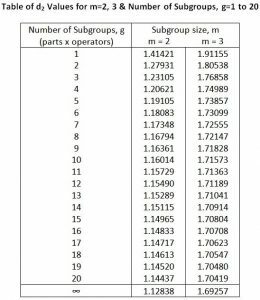 The number of subgroups (g) is the product of the number of operators and parts. For example, assume we have ten parts and 3 operators. In total, there are 10 x 3 = 30 subgroups. So g=30. Since “m” and “g” can change from one Gage RR study to another we must use the correct d2 value based on the combination of “m” and “g” or do we? This fact may not be well known. Often lab personnel will conduct a Gage RR using a standard Excel template developed by their lab manager. Lab personnel may be unaware that their calculations may be suspect if “m” and “g” aren’t chosen with care. How d2 changes as a function of “m” and “g” is beyond the scope of some ISO auditors I have met. In some cases, auditors have issued minor non-conformances when Gage RR studies use less than ten parts. In these cases, the Gage RR studies used the correct d2 values and the Gage RR calculations were correct. Just because we use fewer parts doesn’t mean our calculation are wrong. This is not a reason to issue a minor non-conformance. In this situation, I would have questioned the fact the parts used did not come from the process we want the gage to track! Standard practice has been to use d2 values based on an infinite number of subgroups. This forces “g” to become infinite. This means we would need an infinite number of operators measuring an infinite number of parts. Since this is not practical, we need a reasonable cut-off. In the table below we see that a value of “g” greater than 15 causes d2 to change little. For example, when m=2 and g=15 then d2=1.148. Comparing this to m=2 and g=infinite then d2=1.128. As illustrated, the difference between these two values of d2 is 1.77%. Such a small change I believe will not impact any conclusion you may draw. In typical GR&R studies, there are 2 or 3 operators; 1 from each shift of operation. As such, how many parts would you need to achieve a value of “g” that is greater than 15? For the case of two operators, we would need eight parts. Let’s consider the following case. Assume we have 3 operators. How many parts would we need to have 15 subgrougs? The answer is 6 parts. For this case, and assuming 2 replicate measurements per part, d2=1.146. For the case of 3 operators, 5 parts and 2 replicate measurements per part, d2=1.150. As observed, the difference between 5 or 6 parts equates to a d2 difference of 0.004. This change is insignificant and will not impact the “K” estimates used to compute our Gage R&R estimates. Let’s consider this situation. We have two operators measuring five parts twice. In this case g=10 and m=2, this scenario yields a d2=1.160. Again, the observed difference is insignificant. By now you may be thinking, “I don’t need to measure that many parts to conduct a Gage R&R study!” This truth is more is often better. The d2 values do not change a lot as the number of parts decreases – which is good news. But, as the number of parts decrease our ability to estimate the true variation in our process decreases. Also, our ability to estimate difference in Gage Repeatability by operator decreases. Recall in a previous post I showed how we can perform an F-test of the Average Range. To test if an F-value of the average range is significant we must compared this to a critical F-value. Critical F-values depend on degrees of freedom. The more degrees of freedom the more we can detect differences in the average range by operator. And degrees of freedom depend on the number of subgroups “g” and the number of replicate values “r” per groups. So, the more parts and replicate measurements we have, the more sensitive our F-test of the average range becomes. In conclusion, when the number of parts decreases the d2 values don’t change a whole lot. But if you thought this fact gives you the go ahead to reduce the number of parts used in a Gage RR study it doesn’t. It just means that your GR&R calculations will not be in significant error since d2 doesn’t change much. To learn more about Range Statistics, d2 values and Gage RR studies read the following posts. Now it’s your turn to ask questions and leave positive comments about this article. I spend a lot of time sharing my knowledge with you and all I ask is that you let me know what’s on your mind. I have big problem. I´m biginner in statistics. I need find d2* value for my set of datas. We measured 8 samples 12 times by 2 operators. In one case we had only 6 samples measured 12 times, 2 operators. Now I´m not able to find d2* value. Measuring each sample m=12 times is quite a lot. Typically, each sample is measured 2 or 3 times. In any event, you can find a table of d2* values on page 203 in AIAG’s MSA 4th Edition manual. Hi Andrew, thanks for your answers on my inquiries again.. just wanna know what is the advantage of using the Average and Range and the anova? Because now i am planning to use the the average and range rather than anova. What us waiting is the difference of the two since they are both methods that compute the variations. Thanks. Thanks once again for your prompt respond on my inquiries. i still have questions regarding GR&R. kindly refer below. 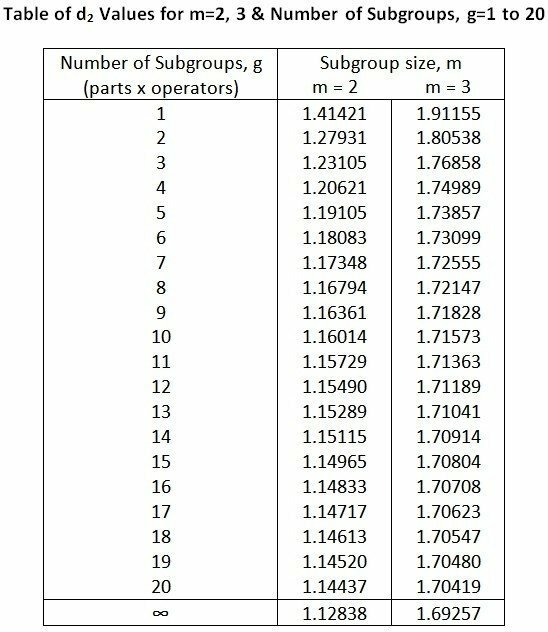 – Minimum of 15 sub group based on D2. what if i have only 2 or 3 parts then, can i increase my appraisers just to get the minimum of 15 subgroups . Example i have 2 parts and 8 operators with 16 subgroups is this correct? or is it always the number of parts should be greater than the appraisers? 2. 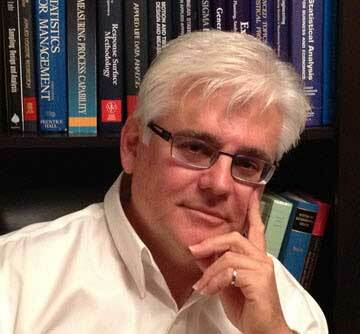 Have the Appraisers that typically evaluate the parts measure the parts. By selecting fewer samples the Part Variation will not properly estimate the actual variation. This will affect the calculation of the Total Variation and will potentially affect the GRR result as a percentage of the Total Variation. Secondly, having so many Appraisers will increase the opportunity of an interaction between the Appraisers and the Parts they measure. This last point assumes you are using the ANOVA Method. If using the X-bar and Range method, a potential interaction can be evaluated graphically. For the reasons I have mentioned above, the AIAG MSA manual recommends 10 parts and a minimum of 2 Appraisers as this exceeds the minimum number of subgroups. However, I have found that using 8 parts and 2 operators yield the same results. Thanks Andrew for your prompt respond on my inquiry. here’s some of my questions regarding the Gage R&R. 2. For measurement systems without specs, a parameter called UCL R needs to be calculated. How to interpret UCL R? 3. Parts Variation (PV)  Should there be a target that this falls within? If PV = 0, GRR = 100%  should we intentionally choose parts with variation? Hoping for your immediate respond on 3 questions. 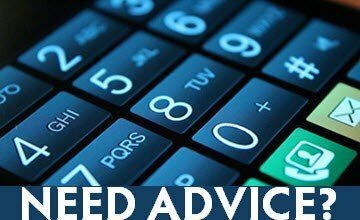 I trust I my response will answer your questions. 1. When you have r=2 replicates (trials) and 3 appraisers measuring 10 parts the total number of subgroups is 3 appraisers x 10 parts = 30 subgroups. This value exceeds 15 subgroups. As such, you can be very confident that the d2 constant used for r =2 replicates (d2 = 1.128) is appropriate. 2. The UCL for Ranges is used to evaluate the stability of the Range values across the 10 parts for each operator. Here you are looking to see that the R-bar estimate (average range) is similar between the operators. Secondly, any range value that exceeds the upper control for the ranges may be an indication of operator measurement error. Identify the part that has a reading that contribution to the excessive range value and re-measure. If the range value falls below the UCL for the Ranges then it is an indication that the previous value was measured in error. 3. When the PV = 0 then the sample is incorrectly gathered. You should seek to collect samples that represent the variation for the process under study. Please note, if the process has sources of special cause variation then the samples will inflate PV and the GRR may look better. Since the goal is to have a process that operates in control then gather samples that represent common cause variation. If the Gage RR is acceptable then in means that the measurement system will be suitable when the process is eventually improved. Gage R&R uses the d2 constant in its calculations. These d2 values are derived based on an infinite number of subgroups and these d2 values depended on the number of subgroups. Suppose you have 10 parts where each part is measured 2 times by 2 different operators. In this case, the number of subgroups is 20. When the number of subgroups is 15 or less the d2 values begin to deviate a no longer estimate the true d2 value. By specifying the number of parts at 10 and the fact you need a minimum of 2 operators to compute Reproducibility assures the number of subgroups (10 parts x 2 operators = 20) exceeds 15.